Upon her return from Holland where she did a bit of spying for Charles II, Isabel, Lady Wilde, one of His Majesty’s mistresses, finds herself in debtor’s prison, from which friends had to rescue her. 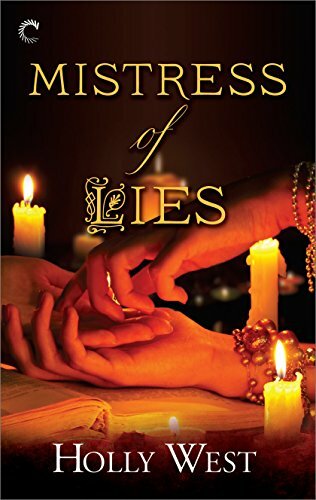 Realizing she can’t rely on Charles to protect her, Isabel begins the lucrative but secretive business of portraying a fortune teller, in order to make ends meet. It’s as herself, however, that she’s about to meet her greatest challenge, when a young beggar girl comes to her house demanding entrance. The girl is much more, however. She introduces herself by a name Isabel knows well—Susanna Barber—for it’s her own mother’s. The girl further confounds her by stating she’s the child of Isabel’s older brother, Adam Barber. Isabel is shocked and disbelieving. Susanna has a fantastic story to tell . . . her father survived the plague, nursed by her mother at a plague house. They married and then he was murdered, after which her mother became a transportee to America where Susanna was raised. At the age of twelve, the girl determined to find her father’s family and with the help of a friend, returned to England. She also gives Isabel a ring which she recognizes as one crafted by her brother. With this dubious proof, Isabel sets out to determine the truth of Susanna’s story and immediately discovers contradictions in the story of Adam’s death as told to her by friends. Those same friends try to discourage her in her quest. Even Isabel’s younger brother offers no assistance. Nevertheless Isabel persists, using her persona of Mistress Ruby to ferret information from friends and foe alike. Her belief in Susanna’s story is confirmed when the child is abducted. What follows is an account of the devastation of the plague as it swept the countryside, of those who perished and those who didn’t. Amid it all, Isabel discovers a family scandal which coincides with Adam’s so-called death. She visits Sir Richard Winser, Adam’s mentor. Now Isabel discovers Margaret didn’t die, but may have survived become Adam’s wife and Susanna’s mother before being transported to America. If so, she was witness to Adam’s murder, but the question remains: Why was Adam killed and by whom? Why did her family say Margaret died also? When Isabel finds the answer, she will wish she hadn’t. Interspersed with historical facts and insights into Charles II’s court, Mistress of Lies is an enlightening first person account of the plague years, of social upheaval, lives lost and the steps taken by those who survived. The mystery of Adam’s death is a convoluted affair in which Isabel’s own life as well as that of her niece may be forfeited if the truth comes to light. Ultimately, this title chronicles one woman’s search, at the risk of her own life, for the truth of her brother’s death.